Located near the intersection of Ogden Ave and 31st St, Extra Space Storage serves Cicero residents near Stickney, Berwyn, South Lawndale, Little Village, North Lawndale, and more. Locals will recognize our facility west of Columbus West Elementary School near Dunkin' Donuts and Steak'n Egger. Looking for affordable self storage close to Chicago Midway? Extra Space Storage is about 5.1 miles away, so we're a convenient option for Chicago-area residents and visitors. 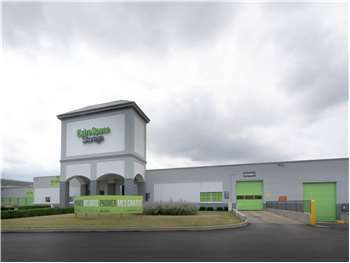 Good, clean & climate controlled storage at a reasonable price in comparison to other companies. Good customer service personnel also. Near the intersection of Cermak Rd. and Western Ave.
Drive south on S Austin Blvd. Pass Morton East High School and continue straight. Turn left onto W 31st St. Turn right onto Ogden Ave. Our facility will be immediately on the left. Drive north on S Central Ave. Cross I-55 and continue straight. Turn left onto Ogden Ave. Our facility will be immediately on the left. Drive southwest on Ogden Ave. Cross S Cicero Ave and continue straight. Cross 31st then our facility will be on the left. Drive northeast on Ogden Ave. Cross Ridgeland Ave and continue straight. Our facility will be on the right after Dunkin’ Donuts.